Had club today and as usual it was a GREAT day with the girls! 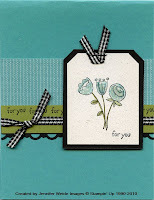 First up was a card inspired by a sample in the Sale-A-Bration Mini catalog (p. 2, inside front cover). Card base is Bermuda Bay. Accent piece across background is a Bermuda Bay piece of DSP from the Welcome Neighbor DSP pad from the SAB Mini catalog. One of the FREE items you can earn during Sale-A-Bration. Time is running out-get those orders in NOW!!! A strip of black was edged with Scallop Trim Border punch (another FREE item) and layered under a strip of Old Olive. Across the top edge of the Olive I stamped the "for you" stamp. Black Gingham ribbon was tied around the strips after layering them together, then adhered over the bottom edge of the Bermuda DSP. For the main image I stamped the flowers in Black Stazon on Naturals White cardstock. The image was colored using a Blender pen & the Classic Bermuda Bay & Old Olive ink pads. I use the blender pens to achieve a lighter tone than what a marker gives. I did use the fine tip on the markers for accents inside the flowers, stems & leaves. The "for you" was also stamped in the bottom corner. The top corners were punched with the Tag Corner punch. The flowers were layered onto Basic Black. A staple was used at the top to attach a strip of the ribbon. The tag was attached with dimensionals over the background accents. Lastly, Crystal Effects was applied over the flowers and Dazzling Diamonds glitter sprinkled over.